The One Movie Blog: Through the Looking Glass: Buster Keaton’s "Sherlock Jr."
Through the Looking Glass: Buster Keaton’s "Sherlock Jr."
Over sixty years before Woody Allen had his characters pop off the screen and into the film’s reality in The Purple Rose of Cairo (1985), Buster Keaton had done the reverse. 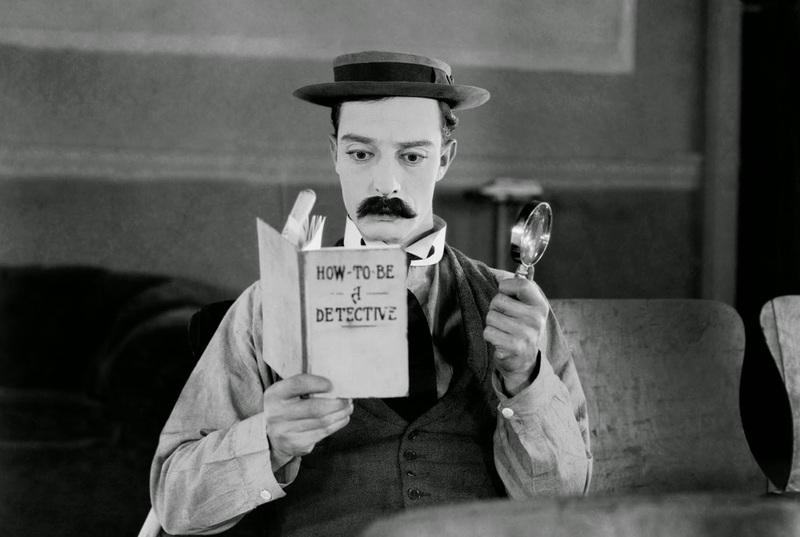 In Sherlock Jr. (1924), the most silent of all silent clowns played a movie projectionist studying to become a detective. Falling asleep in his booth, he dreams himself into the picture, simply walking down the aisle and into the movie-within-a-movie, where he finds he is at the mercy of film space and film time. While he stands still, maintaining his space-time continuity, the “unreal,” cinematic environment surrounding Buster undergoes the editing process. His universe instantaneously shifts from a park to a desert, to an ocean, to a snowdrift, and the character, although maintaining complete control over himself and his actions, is powerless against the filmic montage that changes his physical surroundings. The scene epitomizes and exaggerates the conditions in which Keaton the filmmaker has placed Buster the character throughout his career. In film after film, he battled immense natural forces and huge mechanical objects which were beyond his control; in film after film, he simply reacted to the environment and the situation as pragmatically as possible, generally in ways that would solve his problems. Again and again, with elegance, poise, and superb command of his body—at once the most malleable and most tensile of physical objects—Buster made impossible physical stunts look not only possible, but effortless. He used no stunt doubles, no tricks, no sleights of camera or editing. Keaton’s creative ideas as director, his inventiveness and determination, parallel his ideas as a clown. When cinematic wizardry is used, as it is in the montage sequence of Sherlock Jr., it makes Buster’s life harder, not easier. But the sequence is more than just stunting. It is perhaps Keaton’s clearest realization of the cinema’s mechanical basis, his greatest expression of control over the first and ultimate machine of his career—the camera, that unique mechanical object capable of representing and reshaping reality at the same time. Because, as much as Sherlock Jr. pretends to be about something else, it is a film about film. By taking us inside the picture alongside Buster—and constantly telling us we are, indeed, watching illusion unfold—Sherlock Jr. drops its light comedic premise (about a young man’s wish to become a detective and his romantic troubles) and becomes an almost abstract, unwaveringly funny, look at cinema itself. The film opens on the Great Stone Face. The unfailing calm and inexpression of that face has become a stony cliché, but it bears further investigation. Like Keaton’s films themselves, which seemed pointedly pointless but hinted at depths beneath the surface, the Keaton face is marked by tension between appearance and essence. In the first scene of Sherlock Jr., the face is still, but the eyes move quickly, alertly over the lines of his detective’s manual. Throughout his career, the demeanor of Buster’s characters—no reaction to anything around them, no smile, no laugh, no tear, no puzzlement, no inquiry, no anticipation, nothing—lured us into assuming that he doesn’t feel or think. The Keaton character, though, is not unfeeling, and certainly not stupid, often using his intellect more than any other silent clown—if in doubt, watch a Harry Langdon film. Beneath the frozen mouth and blank stare, the gears of his brain are constantly clicking and turning. In the opening sequence of Sherlock Jr., he remains expressionless, but the eyes bespeak the ceaseless activity underneath, the kind of activity that will translate itself into action, not expression. The face is a mask, a ruse; it knows more than it shows. When Buster gets going, his formidable body, through its posture and motion, will reveal his thoughts and personality better than any facial expression ever could. Before he can react to the words on the page of his book, however, Buster is suddenly—and rudely—awoken to reality. A lowly projectionist instead of a great detective, the character is told to stop reading and clean up the theater. As he goes about his business, the activity beneath the mask slowly reveals itself. 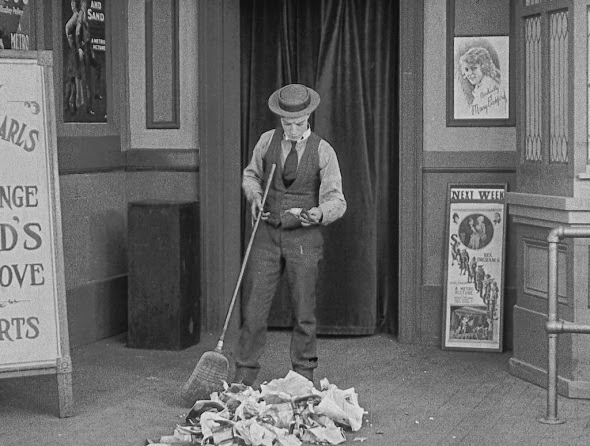 Sweeping the garbage of the floor, Buster gets a newspaper stuck to his broom. Without second thought, he steps on it to remove it—a perfectly ordinary reaction. Now it is stuck to his foot. In order to get it off, he steps on it with his other foot. That merely moves it from one side to the other, without relinquishing its gluey grip. Increasingly annoyed—as we can tell by his gestures and their sharper, staccato quality, not his unchanging expression—he bends down to grab the newspaper. Of course, now it is stuck to his hand. As if his next action is only the logical extension to what had come before, Buster dives to the floor in one swift movement, his body like a coiled spring, and catches himself just in time for one of the theater’s customers, walking by, to unknowingly remove the newspaper from Buster’s hand as he steps on it. Within a few minutes we have started to get a glimpse behind the mask; even when going about perfectly routine chores, Buster is careful, composed, pragmatic, extremely flexible at responding to obstacles, completely certain of the task to be accomplished, and wildly imaginative in accomplishing it. Soon he is presented with a new task. Looking into the window of the store next door, Buster notices the boxes of chocolates and thinks of buying his sweetheart a gift. Unfortunately, he can’t even afford the smallest, cheapest box. As he continues to sweep up discarded papers and wrappers, he finds a dollar bill—just what he needed. Within seconds, a woman comes by and says she has lost a dollar. Buster, ever logical, determined to be given proof that it is indeed her bill, asks the woman to describe it. The combination of sensible, pragmatic action—the description of a lost item—and the complete impossibility and uselessness of describing the distinguishing characteristics of a dollar bill—all dollar bills look the same—is only one way in which Keaton combined sense and nonsense—the other being bizarre, far-fetched ideas worked out logically and successfully, therefore made to seem natural and ordinary. After returning the dollar to its (proven) rightful owner, Buster finds two more bills in the garbage. An old lady comes along, swearing she had lost a dollar. Buster asks for the description, and, satisfied with the answer, presents her with a bill. Disheartened, he keeps sweeping. A man interrupts him. Having given up on the idea of keeping any of his spoils, Buster hands the man the dollar. Surprisingly, the man hands it back. Buster calmly waits and watches as the universe has presented him with another, unintelligible action. The man starts digging through the garbage, retrieves a lost wallet, and pulls out the huge wad of cash inside to count it. Keaton’s eyes widen; as soon as the man is gone, the character dives into the heap of papers (head down, his legs sticking out into the air) to look for more—a sensible response to the completely insensible conditions he’s been presented with. Without any luck, but still in possession of one of the dollars he’d found, Buster goes to the store to buy his girl a box of chocolates. Walking over to his house with the small gift, he devises a way to win her affections. With one stroke of his pen, the $1 on the back becomes $4. Now all he needs to do is turn the box over when he gives her the candy, looking away and feigning indifference when she looks impressed. His gift received, Buster musters up the courage to ask her to marry him, presenting her with a ring and a magnifying glass so she can see the diamond—always practical. Before she can accept the proposal, however, another man walks in with a (much bigger) box of chocolates, and takes Buster’s girl into another room. Keaton sits impatiently on a couch in the right side of the frame in the foreground; the girl and the other man talk in the background on the left. Tired of waiting, the main character stands and walks towards the other room. Just as he reaches the threshold, the man closes the curtains. In one continuous movement, Buster turns around and walks back, as if he was just stretching his legs. He waits some more. Annoyed, he goes and opens the curtains, then resumes his seat on the couch as if nothing had changed. He peels a banana and places it on the floor just short of the entryway into the other room, then calls the other man over; he stops an inch away from falling into the trap. Buster gets up and walks over, determined to end the other character’ conversation, only to slip and fall on his own banana peel. The girl’s father appears, distressed that his watch has been stolen. This is Buster’s chance to prove his worth as a detective. He checks his book and discovers the first step is to search everyone. The other man, the thief, slips the pawnshop receipt for the watch into Buster’s own pocket; it is for exactly $4, the perceived price of Buster’s chocolates. Branded the criminal, Buster is kicked out of the house and told never to return. Suspecting the other man, Buster doesn’t give up his pursuit of the true thief. The next step in his book is to shadow the suspect closely. Buster waits for the man to come out of the house, then follows him, exactly mirroring his every movement and action. 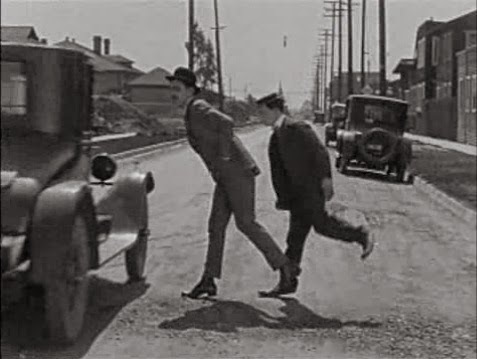 In a parody of the detective genre—which will be intensified in Buster’s dream—the character must overcome all of the obstacles and dangers of the chase; these mostly consist of walking headlong into walls because he’s not paying attention to where he’s going, almost getting run over by a car, getting hit with steam from a locomotive, and getting locked in a train car. The stunts in Keaton’s films are so taken for granted (and so dangerous), that in the next scene of the movie, the actor broke his collarbone and didn’t even notice. Trying to escape the train, Buster runs gracefully along the tops of a string of boxcars, leaping towards the end of the train. The last car comes, speeding by beneath him. Lost in midair, Buster dives for the only object available, the spout of a railroad water tower projecting over the tracks. His weight lowers the spout just enough to release the water supply, a cascade that hits him with the force of a waterfall, hurtling him to the tracks below. Keaton’s neck hit the tracks, but the scene plunged on, and the filmmaker, as unstoppable as one of his characters, plunged with it, running off across a field in the background as if nothing had happened. Meanwhile, the girl, in about two minutes of quick thinking, goes to the pawnshop and finds out who actually sold the watch. This simple reversal of role cancels the film’s entire narrative base. The whole time Buster is dreaming of solutions, there’s nothing to solve. In Sherlock Jr., as in most of Keaton’s features, the first two reels set up a character trait in Buster that makes it seem even more impossible for him to accomplish his task, the Keaton imperative. In this case, it is his bungling incompetence as a detective, a general inadequacy that can only be erased by entering the fantasy world of film. It’s doubtful whether the imperative—the action that he must complete, something he would never do, but somehow has to—is even worth it. Like most of Keaton’s leading ladies, the girl in Sherlock Jr. that he must win back is not much worth winning. Merely providers of literary motivation, the women in the filmmaker’s works have little value except that Buster wants them. He has already shown us that the girl in this movie is shallow: he needs to pretend he is richer than he is, changing the price on the box of chocolates; she looks disconcerted when she sees the modest engagement ring; she instantly leaves Buster when another man appears with a more expensive gift; and she doesn’t stand up for him when her father accuses him of stealing the watch. In contrast, the illusive world of cinema and its characters seem perfect; indeed, it encourages us to think that if we could somehow enter it, we would be perfect as well. The romantic melodrama Buster is screening at the theater, “Hearts and Pearls,” is infinitely more inviting than the real world, where he has been blamed for a crime he didn’t commit, he has lost his girl, and he is too incompetent to set it right. 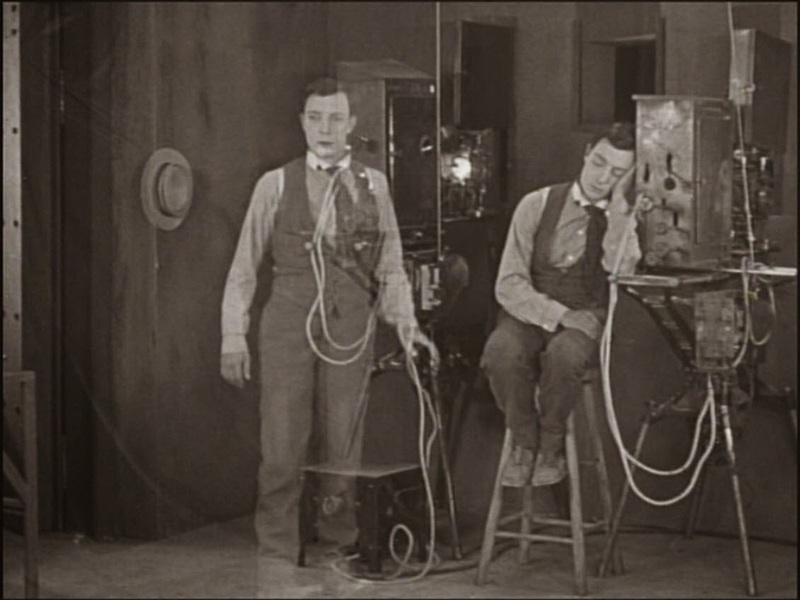 As Buster falls asleep in the projection booth, the characters onscreen turn their backs to the camera. Seamlessly, through a dissolve, when they face us again they have become the people in Buster’s life. Now it is Buster’s turn to enter the world of his dream. While the real character sleeps in a chair, the director uses double exposure to create a transparent second self who rises. He even puts on a second, ghostly dream hat he picks up from a hook, while the real hat remains hanging on the wall in the booth. The pervasive sense of surrealism that dotted Keaton’s work and placed him, given the time-period, in the near-avant-garde comes to full realization in this sequence. Buster’s dream self emerges from the projection booth, walks down the aisle, and climbs up onto the movie screen, entering the looking glass of cinema. But admittance doesn’t come that easily. The character is promptly kicked out. The girl in the film, now Buster’s girl, is being mistreated by the other man. Buster goes at it strategically, climbing the side steps to the screen as if he means to sneak into it laterally, unnoticed, instead of leaping into the image headlong. The second time, he succeeds, but the film betrays him, cutting from the room where his girl is being molested to a shot outside the house. From here on, the character finds himself at the mercy of film space and film time. He goes to ring the doorbell to the house. Waiting for an answer, he leans against the door frame, but—cut again—there is no frame to support him, the steps beneath him collapse into thin air, and he tumbles over a bench in a park. He decides to sit on the bench, only to find himself sitting in the middle of a city street’s busy traffic. Taking a step towards the sidewalk to avoid a car, he almost falls off a mountain precipice. Slipping and scrambling to a safer position, he then peers over the cliff, only to discover he’s now in a forest, staring directly into a lion’s hungry jaws. Retreating from the animal, he walks into the path of an express train in the desert. Sitting on a sand mound, he is instantly sitting on a reef in mid-ocean. He dives, but there is no water anymore, only a snow bank, where he gets stuck head first. Extricating himself and reaching towards a tree trunk for support, he is back in the garden, falling over that same bench again. This is one of the most brilliantly conceived and executed special effects sequences in film history. Too intricate to be funny, it provokes astonishment and admiration, not always laughter. 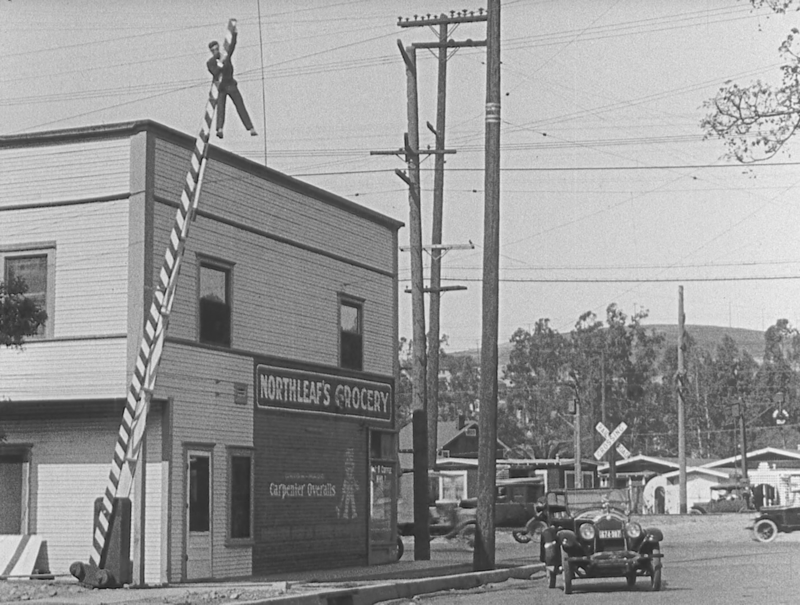 The montage stands very much at the heart of Keaton’s style, imagination, and comic genius. The mechanical perfection of the stunt is extraordinary, but behind the gag and the mechanical ability to work it is the sheer marvel of having conceived it. This is farfetched lunacy at its best, dependent on tricks, divorced from human reality and feelings. Again we have a combination of sense and nonsense, as a human being tries to make sense out of impossibly changing surroundings. The activities of the universe—in this case cinematic, in other Keaton films real—make no sense, but Buster goes about his business, trying to deal with it in the most rational, practical way he can, creating a conflict between a sensible Keaton and a senseless world. The foray into the screen’s reality is at first disastrous. Real men are not at all equipped to inhabit the dynamics of film; its properties and man’s properties are altogether contrary. Continuous time and space becomes discontinuous, broken, fragmented into pieces that are reassembled seemingly at random. Life (generally) moves logically, in linear fashion from cause to effect, from 1 to 2, A to B. Film, arbitrary on all counts, moves from 1 to B, to 8, back to A. Cinema is eternal dissolve, eternal transformation, at the mercy of an unknown, unseen hand wielding a scissors or adjusting the lens. Try as he might, Buster’s pragmatism and ingenuity cannot save him here. Only when Buster has truly, fully entered this universe can he control it. He is no longer Buster, the film projectionist, then, but Sherlock Jr., “the world’s greatest detective,” “the crime-crushing criminologist.” The character has been transposed to the unreal reality of the movie, abandoned his incompetence, and become what he always wanted to be—but couldn’t—in real life. If there is something to be said for cinema and wish-fulfillment, here it is, elegant, white-gloved, gently ringing the doorbell with the fastidious delicacy worthy of caressing rose petals. If Sherlock Jr. is an investigation of film as a whole, it also (comically) explores the detective genre in particular, taking its conventions and exaggerating them to the point of parody. A pearl necklace has been stolen, much the same way the watch was stolen in the film’s reality—if that’s not too much of an oxymoron. Sherlock arrives to the scene of the crime, and promptly tells the victim there’s no need to explain the situation at all; “this is a simple case for me.” As circumstance would have it, the butler did it—or at least is in on it—and the criminals plot the detective’s demise. The unbelievable death plots the crooks hatch for poor Sherlock go beyond our abilities to suspend disbelief. One by one, Sherlock escapes their murderous intentions, including a guillotine-like axe rigged to fall over a chair whenever anyone sits on it, poisoned wine, and explosive pool balls. The detective only sits on the edge of the seat, leaning forward, so as to not trigger the axe; he exchanges drinks with one of the thieves; and, hilariously, plays an impossible game of pool in which he hits every single ball but the one meant to explode: the other balls hop over it, make turns around it, move out of the way. As he leaves the house, we discover he knew about the plans to kill him all along, and had switched the rigged ball out for an ordinary one. “By the next day, the master mind had completely solved the mystery,” a title card informs us—“with the exception of locating the pearls and finding the thief.” Again, Buster must shadow his man, and, again, he takes a few doors to the face and is left stranded on the roof of a building, from where he will jump two stories down and land in the back seat of a moving car carrying the villains to their hideout. Outside the house the criminals have gathered at, Sherlock is met by his assistant—Watson Jr.? The man has brought him a hoop with what looks like some rags inside, which Sherlock places in the window without explanation. Clearly, the detective’s intention is to get caught, as he stands outside the window whistling, but why? Whereas Chaplin preferred to bring us closer to his character both emotionally and physically, Keaton’s camera worked much farther away from its human subjects; even Buster is often nothing more than a human dot on the horizon, and we don’t ever know what he’s thinking before he does it. The long shots worked to emphasize the interplay between man and huge mechanical or natural forces. They gave Keaton the space to move and the vast panoramas to contrast with his moving body. But the long shot also fulfilled another essential function; it allowed the filmmaker to show exactly how a particular mechanism works, to explore relationships of cause and effect and illuminate all relevant elements of a process. In Sherlock Jr., Buster’s escape from the thief’s hideout is filmed in one such shot, perhaps the most brilliant process long shot of his career—and what a process! By dissolving the fourth wall of the house, Keaton allows one single shot to present: a room where Sherlock is surrounded by thugs; the open window where the character placed the paper hoop; the exterior of the house outside that window in the left half of the frame. Buster grabs the pearl necklace inside the house, dashes towards the window, leaps through it and through the hoop, puts on the dress stuffed inside the hoop in midair, rights himself on the ground outside the house, and impersonates a little old lady (now wearing the dress), as the thieves race outside to catch him. All of this happens in a few seconds. Without the long shot, it would have been impossible to believe that any comic acrobat could perform such a stunt. Behind the mechanics, again, is the idea. Who else could possibly think of escaping in such an incredible way and with such an incredible means to such an incredible disguise? Keaton takes incredibility to the third power and makes it credible. Once Sherlock is recognized by the crooks, the chase is on. Running into the street, the character is picked up by a motorcycle—and by picked up, I mean almost run over and hoisted into the handlebars. After the first hesitant look around, Buster makes himself at home. What else is a pragmatic man to do when riding at full speed on the handlebars of a motorcycle than cross his legs, look over to the driver and start pleasantly chatting away? The scene takes Buster—and us—through roaring traffic, converging vehicles and streetcars, past workmen digging a ditch at the side of the road (who throw shovel-fuls of dirt in his face), past—or, more appropriately, through—a tug-of-war at a stag party, through the woods and past a nice picnic gathering, over dirt roads and a small stream, and plunging headlong across a high, narrow aqueduct. A few moments later, the character’s thoroughly reckless journey brings him into obvious collision course with a rapidly advancing train. The motorcycle is in the foreground, the camera moving with it at violent speed. We can see plainly that it is Buster on that bike, and, just as plainly, in the background, the onrushing locomotive speeding inexorably towards him and the camera. Buster and the motorcycle rip across the tracks, clearing the train by inches. On a curved road further down, he sees a monstrous machine, a solid rectangle on wheels, approaching him around the bend. He keeps going, sure to collide. The machine turns the corner and proves not solid at all; it is a platform on giant legs, with nothing but open space in between. Buster sails through with aplomb, never missing a beat. Conveniently, the roaring spectacle of a ride comes to an end as he tears through the wall of the house his girl is being kept hostage at. Sherlock grabs the woman and takes her out the window and straight into a car as the thugs enter through the door, and the chase is on again. After a long, high-speed drive down empty mountain roads and busy city streets, the detective ends the chase by throwing the exploding pool ball at his pursuers. Like a silent James Bond, he prepares to kiss the girl, interrupted only by the lake a few feet in front of the speeding car. The four wheel brakes leave the entire frame of the vehicle behind, and Sherlock and his girl float on the lake in what’s left of the car, using its hood as a sail. Having completed his masterful escape, saved the girl, and retrieved the stolen pearls, Sherlock goes to step out of the car and falls into the lake. The impossible comes easy to Buster; it’s the ordinary and everyday—like getting out of a car—that baffles and defeats him. The dream fall awakens Buster form his cinematic reverie. Returned to the reality of the projection booth from his glorious screen dream, a look of sadness and regret instantly flashes across his immobile face. The film world, as difficult as it is to control, is a place where he can be a hero and a great detective, whereas in real life he is only a projectionist, alone, and suspected of theft. On cue, his sweetheart shows up to tell him she’s made a mistake in accusing him. Now Buster must deal with his real girlfriend, but he can still look to the screen for advice. The movie’s conclusion shows Buster how to conclude his own story with the girl. Gazing towards the screen, Buster sees the actor taking the woman’s hands; he takes his girls.’ She doesn’t seem pleased. There must be more. Again, he looks to the screen. He kisses the hands—look to the screen—places the engagement ring on her finger—look to the screen—gives her a peck on the mouth, not exactly the romantic full-bodied kiss of the theater screen. As he looks towards the movie one more time, the image dissolves from a kiss to a scene of the happy couple, a multiplicity of babies on their laps. Confused, Buster scratches his head. Fade Out. 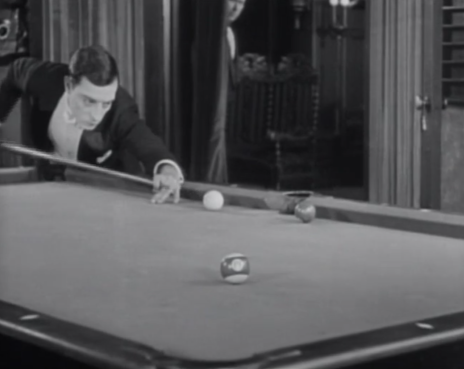 As Buster mimics the actions on screen, Keaton provides a visual parallel between the activities in the booth and those in the movie. Not only are they the same, but the director shoots the scene through the window of the booth, effectively framing “reality” like a film screen does. Keaton has made a movie about a movie, an intention especially obvious in this conclusion. Through Sherlock Jr., he has discovered both the ways the cinematic universe defies nature and reality, and the way nature and reality would copy cinema if they could. The story, gags, situation, and character all proceed (whether seriously or parodically) from the same idea: the depiction of life-in-cinema and cinema-in-life. If the real plot of the film (Buster falsely accused of theft, his illusionary heroism as he imagines performing exploits on screen, discovery of the thief, reuniting with his girl, and the romantic kiss at the end) is predictable, the imaginary “movie” plot makes up for it in energy, breathlessness, and dazzling surprise. Together, the two story lines evoke the most fundamental differences between reality and the movies. The former is static, uninteresting, unfair; but films not only reflect our deepest desires, fears, needs, and dreams, they create them, spinning fairytales out of facts. As the screen is darkened and illuminated with vast and colorful possibilities and impossibilities, the ordinary can become extraordinary.